I had planned for some Pinterest experimentation in June, but I wasn’t able to get there due to a number of different projects competing for my attention. 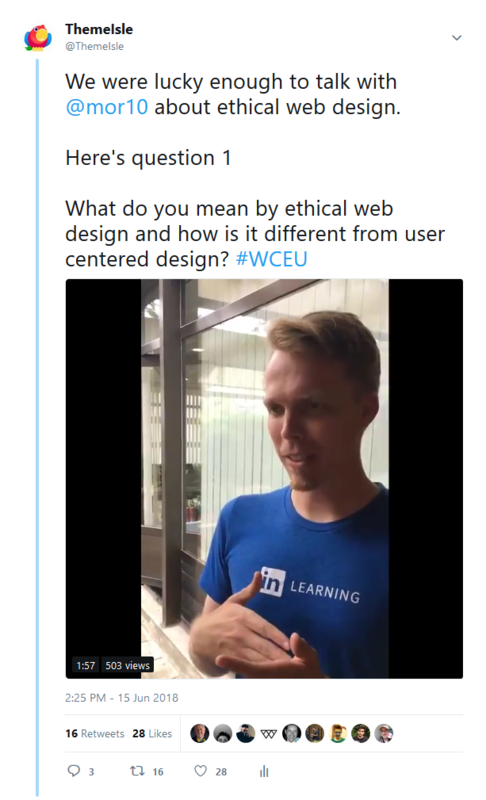 I found some cool stuff on Instagram and my focus on WordCamp Europe gave me a good opportunity to play with Twitter videos. These experiments were possible because of our role as media partners and we conducted a number of interviews with both speakers and attendees. We also used our very own article on social media videos to structure our interviews. My second case study is all about Instagram. And Facebook. Because it has to be about Facebook to some degree, right? I made a few mistakes in June but they showed me a few things about how Facebook and Instagram interact. Finally, I have been digging around for a few tools to make life easier and I am going to share them with you. As I mentioned once or thousands of times already, June was a rough month with WordCamp Europe dominating most of our thinking. 2018 was our first run at the media partnership role and this created an extra bit of pressure around our planning. And not an insignificant amount of performance anxiety. While it is possible for planning to be a stressful experience we should remember that it is also utopian. Planning is a wonderful thing; you imagine achieving so much and layer in so many dreams, wants, needs, and goals. When WordCamp Europe came around I was very excited because I spent last year watching it from the office on the livestream. This year I was going to nail it. Then…It comes time to get in there and mess up your pretty hands. Not quite perfect. I also volunteered to be part of the communications team and I made a rough, but correct, decision on the first day. We were conducting interviews with the speakers and we had planned to make them live interviews. We reversed this decision because many people actually feel uncomfortable with the live aspect. So, the end result was we had limited equipment for the interviews: no mic, no camera, no tripod. Personally, I am not a huge fan of the live aspect so I should have anticipated there would be some discomfort. This is reasonable and we can live with it, but switching to recorded interviews meant editing. As you know Twitter videos have to be 2:20 seconds long and there is no way around it. We could upload them to YouTube and then re-post to Twitter but our content strategy on YouTube is not incredibly flexible. The speaker interviews were far removed from the content we put on YouTube and they would have a negative impact on the ranking of the channel. Essentially, we would have been using YouTube as a CDN and this would have hurt us. We went with the threaded tweets option but the videos still needed to be cut down to the appropriate time limit and this took time. Balancing everything with the volunteer obligations slowed us down. However, the videos were successful which, to be honest, wasn’t a surprise. 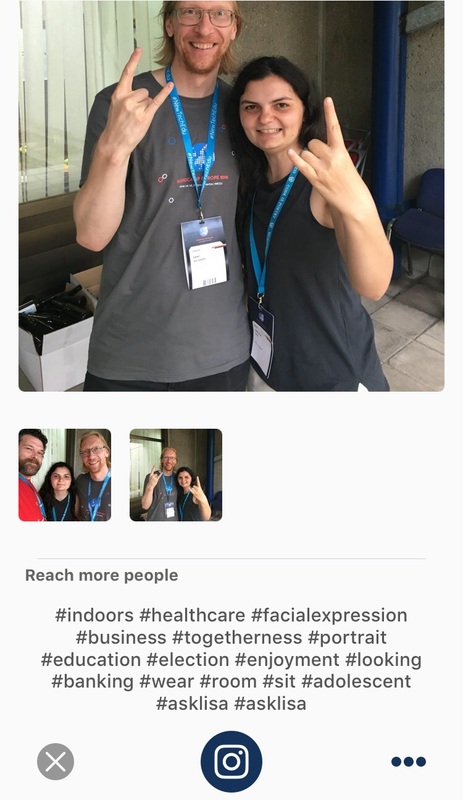 We had a solid concept and any interaction with the official #WCEU hashtag was going to deliver an impressive amount of reach for us. We selected one of the more popular speakers and prepared questions in advance. The process just required some classic research and very little digging. The theme of the talk was announced in advance and he has written an article on the same subject. We just built questions around the article and voila! A pretty good interview. We had requests for a full transcript and got the impressions up to 4,000 for the first question. The threaded interview obviously lost some ground, but it was a better way to present the entire interview without milking it for attention. Rather than drip feed people the interview we linked the threaded tweet in the initial tweet and pinged anyone who commented on the first video. This is a better way to handle it. No jump cuts, but still not too bad either. So, I am not sure if you have heard but business pages are getting destroyed by the Facebook algorithm. As you know I have put on a brave face. My tears are all inside while the outside is all cucumbery. I have a tried a few different things over time. You know, what everyone says to do: post quotes, post videos. It works for these big brands with money burning a hole in their budgets. Usually, we have fewer options, but as I mentioned above you just need to interview celebrities and people will follow you like I do bacon. If you are not able to interview celebrities, there might be a few other ways to skirt the rules. I like playing with Instagram because it is so hot right now. Even with the limitation on the data released, it is clear that Insta is a pretty tasty platform for the hungry marketer. In the mad rush to post on multiple platforms while still looking calm I made a boo-boo. I managed to duplicate content a few times but this caused fewer problems than you would think. 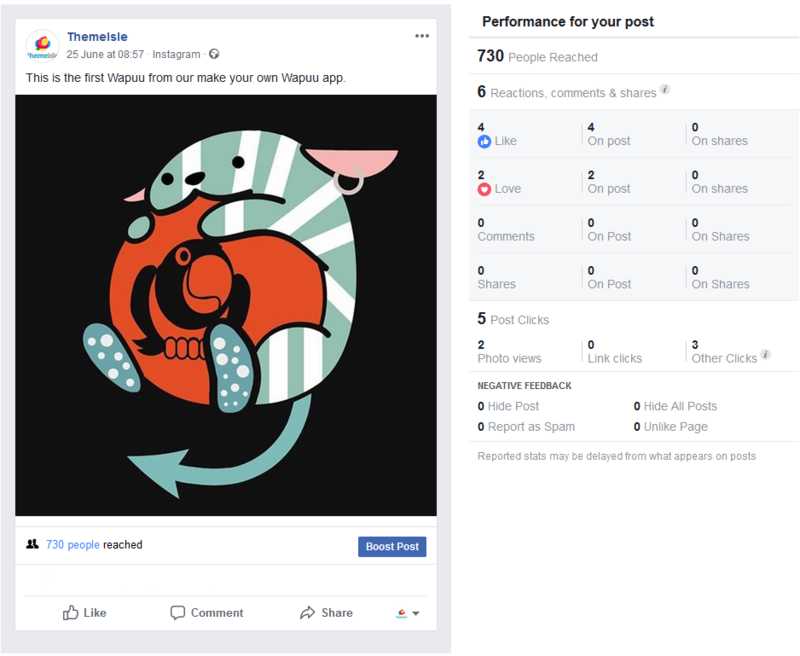 In fact, I got a little reward when the cross-posted content got much better reach on Facebook than an image posted natively. First a little context for you. 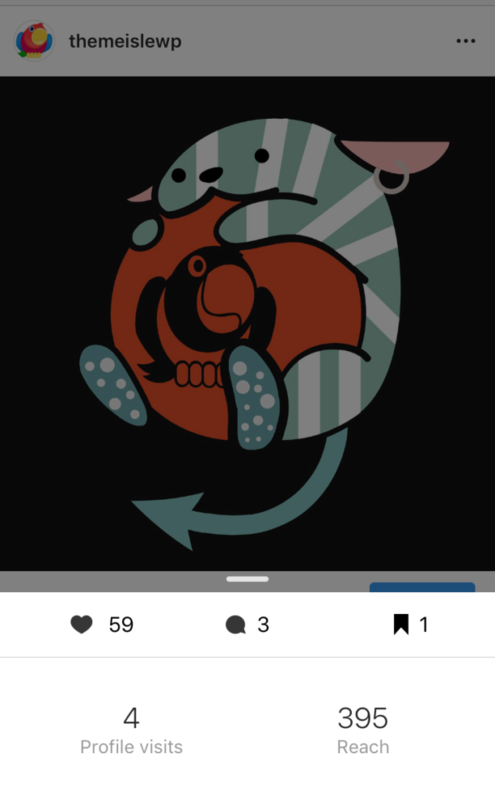 Our most recent Hackathon saw us make a Create a Wapuu app. Wapuu is kind of a big deal in the WordPress community. As part of the MVP and presentation, the team made a Wapuu. We grabbed an image of the little guy for Facebook and Instagram. I first shared it to Facebook and got the expected response. Move along there’s nothing to see here. Wow. Flaming wreckage. The two loves were from the wider company family. I wish I was joking. This shouldn’t have happened like this. This should have been a moment of glory. The WordCamp mascot is much loved. And, I mean much loved. This mashup should have made the people laugh. They never even had a chance. In a typical 3-year-old tantrummy way I took my Wapuu and went home. After a few days, I decided to post it on Insta. Finally, we had found some intelligent people who appreciate a good Wapuu. The numbers are little short of incredible. For example, the reach was half of the Facebook reach. Those hashtags really help. I don’t go crazy; maybe 10-15 variations but they really helped Wapuu get where he needed to go. 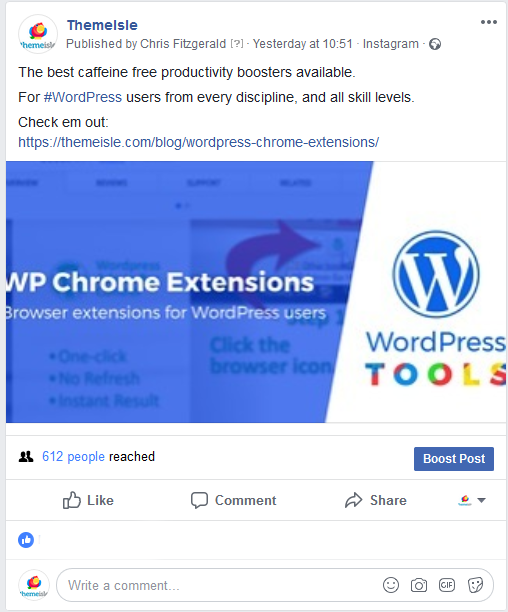 We also got a little fringe benefit with some good attention from influencers within the WordPress marketing space. Finally, I noticed that Wapuu went back to Facebook; just five days after his initial outing, but I left it to see what would happen. I was curious since I had a post reach four people last week when the Messenger button was auto-selected. It turns out that Wapuu did quite well, thank you very much, and suffered no ill-effects from the duplicate post in such a short time. 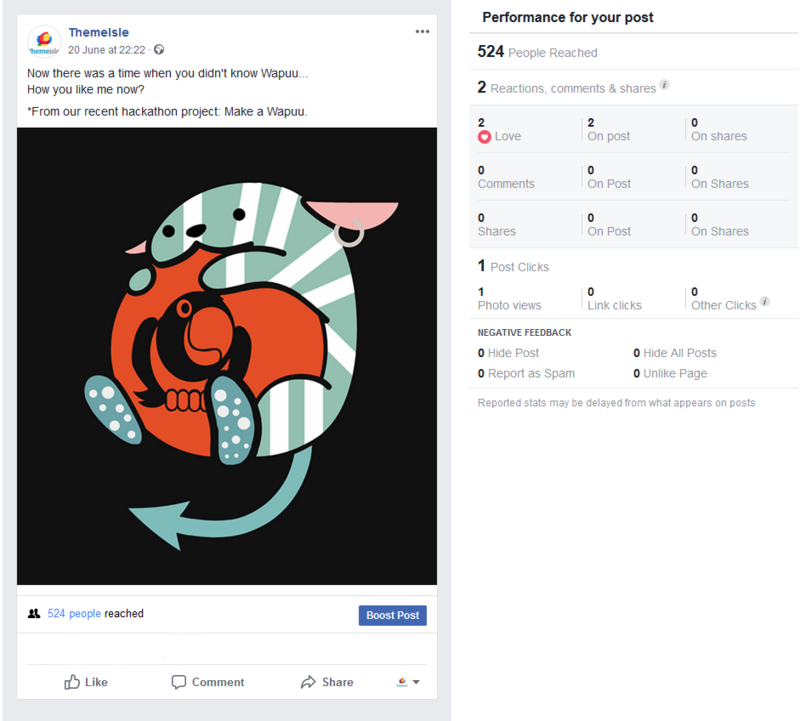 Wapuu got a nice organic reach boost of 39% and some more reactions. It makes sense that the Instagram numbers would feed into the algorithm, but I was surprised given the proximity of the posts. I also ran a similar experiment with link posts. Obviously, the link is unclickable in Instagram, but when it carries over to Facebook the link is clickable. 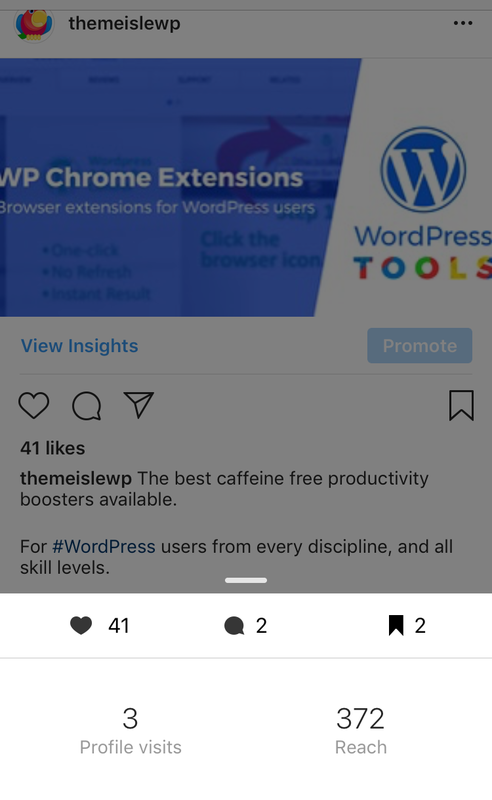 I tried it with an older blog post on Chrome extentions and got a weirdly good response on Instagram. I am a reasonable guy, but that image is awful when it makes it to Instagram. However, it was popular enough. So, when the post is left to ferment on Facebook I found it performed well. Not amazingly so, but better than a post from the day before which had an organic reach of 520. I wanted to find some ways to make my life a little easier, and since my wife really loves the dog, I had a look at social media tools. Is this a case study? Not quite, but I have been meaning to try a different batch of tools for some time and now I have an excuse. 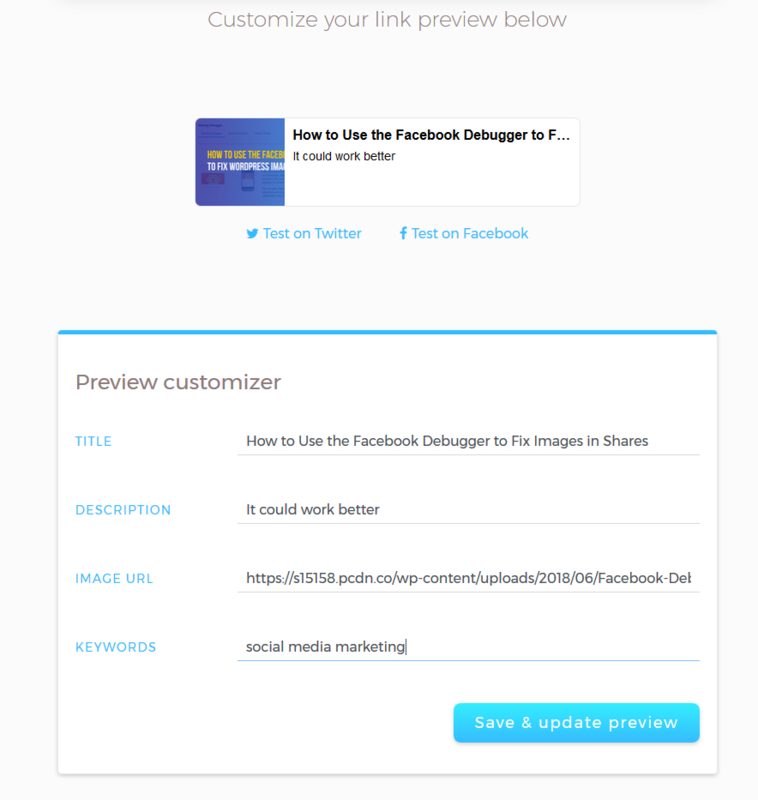 One of the first tools I tried was MetaShort because it offers me the opportunity to easily manipulate the meta data and customize links on Facebook especially. My final review is eh. I did like having more power over the description and image but ultimately I didn’t feel a strong urge to use it more often. The best option for Facebook is to dig in and set it manually then tweak with the debugger. I am interested in using a new tool because I have had some issues with Hootsuite over the past year. I looked at Content Studio this month. It’s kind of cool. I like the way the tools are integrating 3rd party content. The posting options to queue, schedule, evergreen queue are nice. I can see why some of these tools are getting so much traction but Content Studio lacks decent insights at this stage. There’s not much data for digging when compared to a tool like Keyhole and I got a few errors when I tried to compare pages. Finally, let’s go full automation and let Lisa pick our best pictures for Instagram. In this app a friendly AI, Lisa, will analyze your pictures, select the best one and suggest optimized hashtags. I threw a trio of images at Lisa and she picked one without me in it. Clearly, the AI is broken. I also found the hashtags to be…questionable at best. If you look closely you’ll notice #asklisa is in there twice. That’s a little presumptious Lisa. Next month I am focusing on community building. I have a multi-pronged approach that will unfold on Twitter, Facebook, and, hopefully, Slack. I will also devote some time to Pinterest now that we have completed the setup there. The post Posting to Facebook from Instagram: Social Media Case Study #8 appeared first on Revive Social.